Azerbaijan's Deputy Foreign Minister considers that one cannot talk about the intensification of the negotiation process over the Nagorno-Karabakh conflict, saying that there are no changes in the position of the opposite side, and tendencies for change are not observed. Baku has always expressed dissatisfaction with the activities of the OSCE Minsk Group, Araz Azimov told journalists on April 10. He said considering the current geopolitical situation and the events in Ukraine, the relations between the co-chair countries of the Minsk Group are very tense. "I do not believe that, united in the framework of the OSCE Minsk Group, they are seriously searching for a common position," Azimov said. Azimov stressed that the recent meeting of Azerbaijani and Armenian foreign ministers was nothing out of ordinary. "As far as I understand, the Armenian foreign minister adhered to the "position of denial" as always," he underlined. 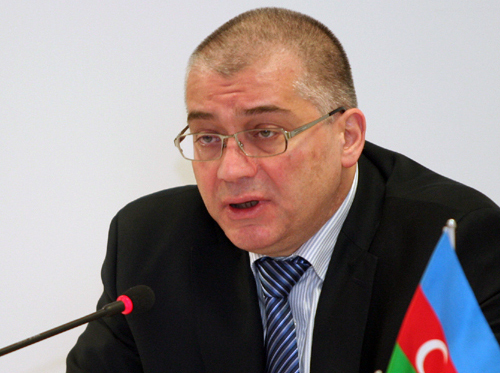 Azimov noted that this situation does not suit the Azerbaijani side. Also touching upon U.S. co-chair of the Minsk Group (MG) James Warlick's recent statements, Azimov said Warlick should get better acquainted with and study the MG documents, and only then go into polemics. Warlick's earlier wrote on Twitter that the Nagorno-Karabakh conflict exists between "Nagorno-Karabakh" and Azerbaijan, while there is no a state entitled Nagorno-Karabakh and the conflict is between Armenia and Azerbaijan. He said a political bias is observed in such statements, noting that Warlick made ​​this statement to reassure Armenia, since the latter tries to present the Nagorno-Karabakh as a "state entity." Azimov went on to say that they (the separatist regime) vainly think that if they are recognized as one of the parties of the conflict, they will be invited to sign an agreement regarding the resolution of the conflict in the next step. "It is clear that Azerbaijan and Armenia are the two sides of the conflict. Placing a small ethnic group consisting of some 30,000 people in any territory does not give it the right and reason to claim that territory," Azimov said. He pointed out that Azerbaijan has always expressed and confirmed its intention to keep the Azerbaijani citizenship of the Armenian population living in Nagorno-Karabakh. Azimov said there are certain steps in the resolution of the conflict, stressing that at the current stage of occupation, the Armenian armed forces must leave the Azerbaijani lands, and Azerbaijan is negotiating with the Armenian side to realize that goal. He also noted that Warlick's words cannot be taken seriously. "Warlick as an OSCE MG co-chair should know the mandate of the Minsk Group, according to which the representatives of the Nagorno-Karabakh region should participate in negotiations as an interested party, and this applies to both Azerbaijanis and Armenians." Azimov said Azerbaijan has never shied away from this format, and stressed that at the next step of conflict resolution, after the end of occupation, negotiations will be conducted with the participation of the population of Nagorno-Karabakh - Azerbaijanis and Armenians - for the settlement of the Nagorno-Karabakh conflict. Armenia occupied over 20 percent of Azerbaijan's internationally recognized territory, including Nagorno-Karabakh and seven adjacent regions, after laying territorial claims against its South Caucasus neighbor that caused a brutal war in the early 1990s. Long-standing efforts by US, Russian and French mediators have been largely fruitless so far. As a result of the military aggression of Armenia, over 20,000 Azerbaijanis were killed, 4,866 are reported missing and almost 100,000 were injured, and 50,000 were disabled.